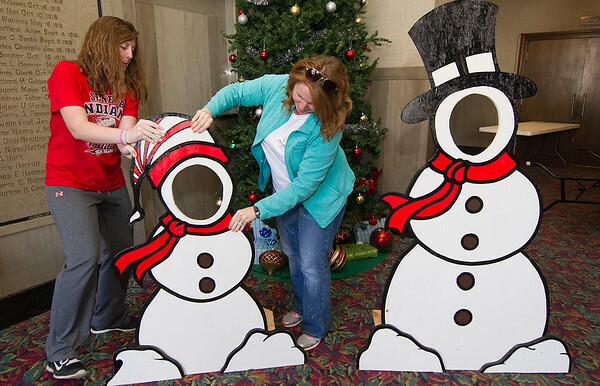 From the left: Jessica Johnson, recreation coordinator for Joplin Parks and Recreation and Carla Bond, business development manager, help decorate Memorial Hall on Thursday for Saturday's 18th Annual Breakfast with Santa. The $6 Breakfast includes pancakes, sausage, and biscuits and gravy and a visit with Santa. Children two and under are free. Parents are encouraged to bring their cameras. Interested persons may register Friday by calling Joplin Parks and Recreation Department at 417-625-4750 or online at http://www.joplinparks.org.